Painting in stages, small washes and light sketches tonight because the trick-or-treaters having me running to the door every few minutes. A little witch rang the bell, dressed all in black, except that she had chosen to accessorize her costume with a string of bright purple beads and giant red glitter covered sunglasses. "Hi! Um, Trick or Treat!" "Well, hi! Are you a good witch or a bad witch?" "I'm pretending to be a bad witch." She leaned in and whispered, "but I'm a good girl." She got two handfuls of candy. It's nearly the end of October, and we are coming closer to that special date when we will be sitting up all night, anxiously awaiting the arrival of The Great Pomegranate. All this crazy experimentation is an awful lot of fun. I've seen some of these paintings around and about lately, and tonight finally found the link to the October 2008 Virtual Sketch Date blog. Yikes! It's due TODAY! What a great photo (from Belinda Lindhardt). I did it so fast that I probably didn't do it justice, but it was fun. The tree is too tall or the cliff is too short... everything is relative, and it didn't matter anyway, since it was more about the color today. So... I'm just playing around a little with shades of grey, or very greyed tones on a small piece of paper early this morning. I thought my sky and background was nearly white until I took the tape off, and then I was astonished at how dark it was. --Background done with a pale yellow ochre wash, dried well, and then a thin mix of rose madder and cerulean was stroked over all. --Yellow ochre and cerulean with a bit of french ultramarine and burnt sienna ( I know -- sounds like a lot, but it worked...) made the most interesting greys today, with lots of granulation happening even if just a touch of cerulean was added. 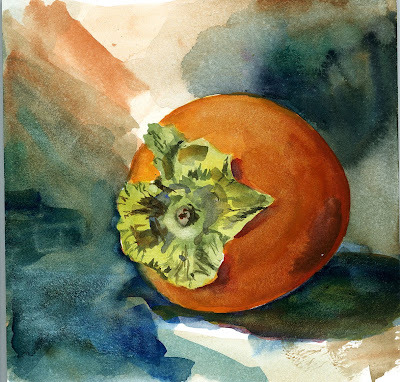 --Dark greyed green -- winsor green (believe it or not) with yellow ochre and french ultramarine mixed in a nice streaky mix, and then a touch of burnt sienna to that to dull it down. 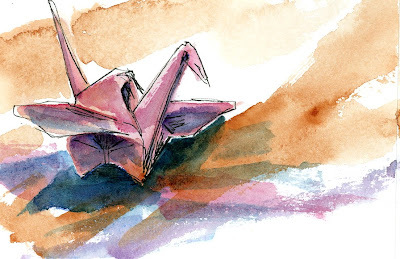 These cranes are easy to draw in certain angles -- in other angles, not so easy. It is a good challenge. And regular paper feels funny after that Aquaboard! By the way, Artoberites, I did draw yesterday -- I just spent my time working on something that isn't finished yet, so I didn't really have anything to post. We all need to bug Diahn to come up with something "artsy" for November, don't you think? A quick re-painting of the panel that was scrubbed in the other post. When the panel dried, the surface was not entirely white -- it was slightly discolored and there were tiny flecks of something dark. I may have scrubbed a bit too vigorously, too (I used a nail brush), and the surface texture felt smoother than the original. The pigment went on differently -- I won't say better or worse, just differently -- than before scrubbing, and it took a little getting used to. I like that the panel wasn't a total waste, but won't plan on saving any "unpainted" panels for pieces that I'm really emotionally attached to. AND, I'm planning a blog re-do, so don't be surprised if it looks a little bit different sometime in the next few days. 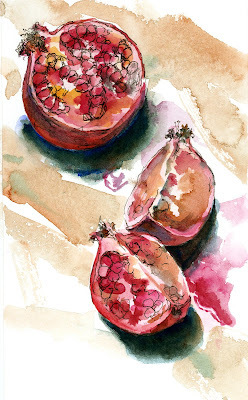 If you subscribe with bloglines, it may also show up as a bunch of new posts, since I think I should have done a label for these pomegranates and pears, don't you? :-) See you tomorrow! Keep warm and dry! I mean, WHAT is THIS? Where did that perspective come from? Or, more accurately, WHAT perspective??? Sheesh. And the colors -- totally off. The more I tried to correct them, the worse they got. And while I'm loving this Aquaboard -- you CANNOT get an even wash on it. At least I can't, and if any of you figure out how to, please, please, PLEASE let me know! The nice thing about making such a major mess up? I get to test the "scrub off factor" of the board. And I filmed it. Just for you. Untitled from Linda M on Vimeo. In case you can't tell -- that's a poorly folded origami crane. See, my experimentation goes beyond painting and into classical Japanese arts. I'm a Renaissance woman, I am. 2. 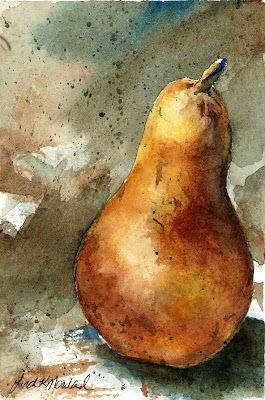 I tried WN gold ochre for the pear. I liked it real well at first, but then it seemed to dull down more than I expected as it dried, especially when burnt sienna was washed over it. It seems to be quite a bit more opaque than it appeared at my first test. 3. Really. 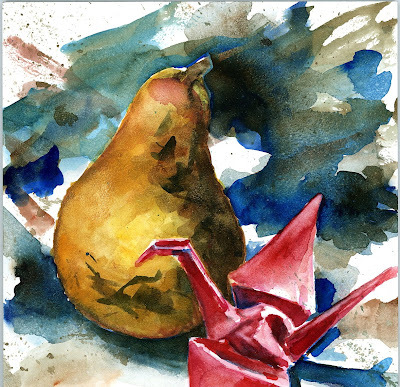 That poor pear has about had it, and I've got to get better at folding those cranes. This looks a little different in the scan than in real life. 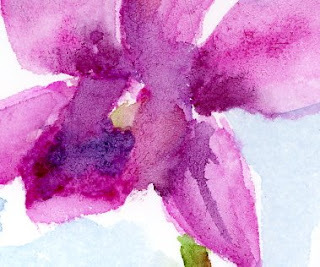 I used a couple of new colors which the scanner seems to really love, especially Holbein's Mineral Violet. In real life this is a bit more pink and cerulean rather than purple, but you get the general idea. I love working with this new board, although it is a constant challenge. Working on it is a real balance of additive and subtractive processes, which can make parts of it look a bit, um, DONE, but it lets me really play. I didn't make a single pencil mark for this (or any of the other paintings on board), doing it all in just paint. Fun stuff, don't you know! It still needs some tweaking, but not too much -- I've about tweaked it to death already -- but that's it for today. Have a wonderful weekend -- get out there and do something fun! Well, like I planned yesterday, I'm playing with a landscape today, if that's what you would call it. 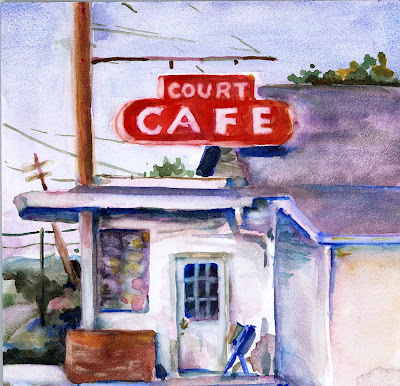 It is of this little building that I pass several times a week -- an older building, an honest-to-goodness diner, with curved corners in front and glass block windows, siding and block painted white, with an old red sign -- a little diner with tons of character, especially in the evenings when the sun is hitting it just so. You know the kind of diner I mean, too. The kind that probably smells like bacon and has the best coffee in the world served in heavy white china cups while you sit on cracked shiny red vinyl seats. I've never taken the time to go in there, but I can imagine. Anyway, after passing this thing for years, I finally stopped a week or two ago and took photos of the building, noticing that the light was "just so" and knowing that I really had to paint it. And then, just a few days later -- just the other day, I noticed that the big red and white sign was gone and a "closed" sign was in the window. I'd gotten my photos just in time, and that was a relief, but still... my little diner that I never went into was gone. Rats. So I'm taking my time with it now. I'm not rushing this little painting. I'm enjoying the diner the only way I can now. Yesterday, driving home from work I passed another great subject. It was another older building with a marquis sign up on a high pole. The glass on either side of the sign had fallen out and there were bare yellow and white light bulbs in the frame with the sky showing through the hole. I'd passed it many times and noticed it, but not with the same eye as yesterday. I even had my camera with me, but didn't turn around to take the photo, since I knew I could take it today. And today -- well today as I passed it with plans to pull over and take a photo, my turn around spot was blocked by a truck. A truck with a cherry picker and a man who had knocked out all the broken glass and removed all the light bulbs and, of course, was fixing the sign. That fast. GONE. Moral of the story -- don't wait until tomorrow. At least do that sketch, take that photo, paint that painting, point that quirky landmark out to your friends or family. It just might be gone tomorrow. GONE. That fast. I figured something out when I bought these pomegranates. 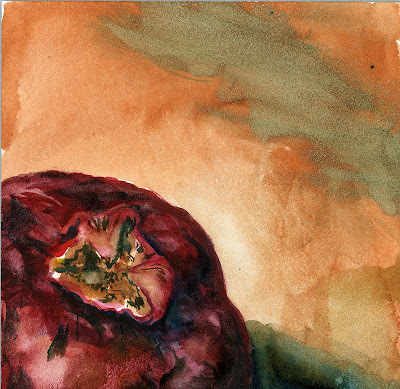 The uglier the fruit, the more interesting it is to paint. These are not the ones that you would buy if you were going to eat them. You'd think they'd give me a discount, but they don't. 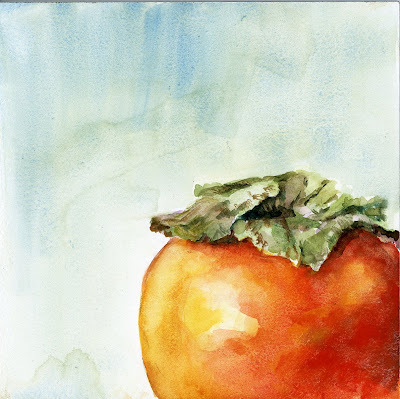 This was done with watercolor on 6"x6" AquaBoard. It is TOTALLY different than paper. If you do watercolor and are looking for something a bit different, I would really recommend that you try it. The smaller boards aren't expensive (about 6.50 for a pack of 4) and the paint lifts off pretty easily. I would be interested in trying to scrub the board totally clean ... maybe on the next one. Diahn talked the other day (in this post) about working in a series, and coincidentally, so have several other people, including Laura (who pointed us to Katherine Tyrrell's great post) . I guess I am in series mode, although I didn't really plan it that way. 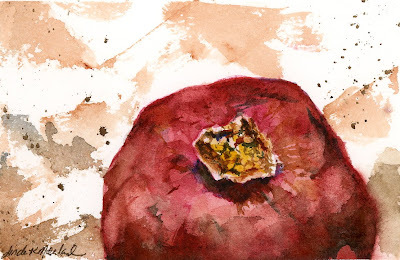 It's just that I'd committed to drawing every day (and painting counts), fruit is readily available, and you can position and reposition the same pieces over and over again. But I'm finding that portraying the same subject over and over helps one to begin looking past just drawing or rendering of the object in a way that makes it hopefully recognizable, and start to look at the way the surface temperature changes from warm to cool, how light reflects, how shadows behave. Plus, it kind of takes the pressure off, and that's always a good thing. Phooey on orchids! 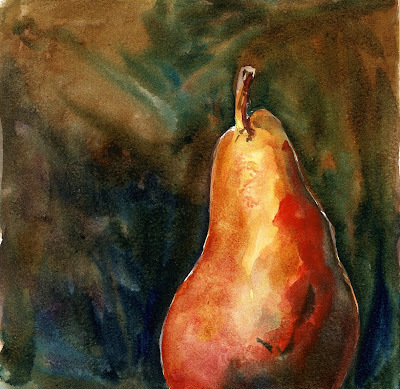 I went to the store this afternoon and picked up a couple of pears and a couple of pomegranates to paint and snack on. Diahn and I had also picked up a couple of packs of 6" x 6" Aquaboard this weekend on our trip to Jerry's, and tonight was my night to experiment. Different. I'll be doing more, and reporting what I discover about this board. You know, last year about this time I was working on the color pink, too, and finally had enough sense to give it up. Sigh. No longer an option. I have to work this out, or it will drive me nuts! 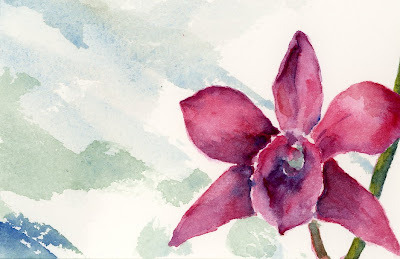 I tried using Sennelier Cobalt Violet Rose, which is a WONDERFUL shade of light pink that is very clear. 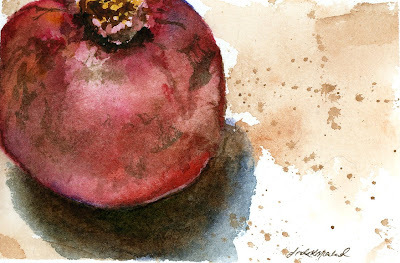 One of the best light pinks I've worked with -- except that, being Sennelier, it has that honey texture to the binder, and then it lifted very easily when I did another wash over it. I mixed in some DS quin magenta and some quin violet -- and finally tried a bit of Sennelier Tyrian Pink (which is nearly as horrible as Opera, but not so blue -- sorry to all of you Opera lovers out there, but the blue in it makes the backs of my eyeballs itch...) And then there was a terrible chemical reaction when I added some blues to make things dark, and everything pushed away from everything else and weird things started happening, so I quit with the paint. As horrible as it was, I didn't worry too much, because I figured it could be fixed in the end by adding ink. In no universe, known or unknown. 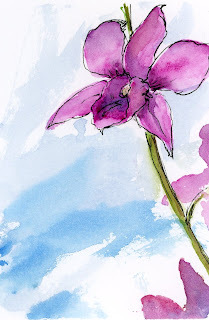 Orchids were on sale at Fresh Market -- just 9.99 for a small pot, so I had to get one to paint. Of course, I got the dark pink / light purple one. I'd been experimenting with new colors and really thought I had it figured out -- until I actually started painting it, that is. What was I thinking? Pink. I will never find the right pink. Meanwhile today we had a neighborhood garage sale. I sold only a little bit -- it was probably the worst garage sale in the history of garage sales ... :-( Oh well. I got rid of a couple of big things that were in the way and the little things can go to Goodwill or somewhere like that. Thankfully I wasn't participating in the sale because I needed the money; I just wanted to get rid of some of the clutter around here. Later on Diahn and I went to Jerry's to pick up a little bit of paint. I'd made a mental note to try out Antwerp Blue (based on something I read) but saw that its permenance "fluctuates" -- it fades in light and then RECOVERS in the dark. ?? WHAT??? I had no idea that paint would do something like that. I was too creeped out to buy it. Waaaay too creeped out. What is it, alive??? Weird. What I did get was a tube of venetian red and a tube of gold ochre. Both are solid classic colors that I don't have and want to play around with. I'll just use a different blue... and I don't want to know if either of them does anything like fluctuate, okay? As for me, I'm just having fun playing around. These little bits are very fun to do. 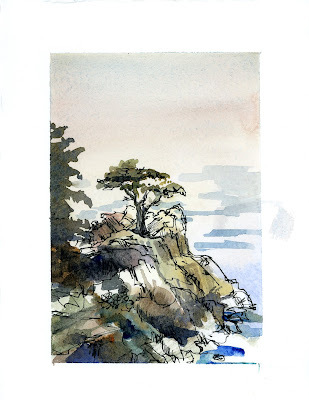 They are on 1/16th sheet of 300# watercolor paper with a border taped off with one-inch artist's tape, so that the total size of the little painting is about 5 1/2" x 3 1/2". I'm also playing around with the idea of adding some new colors to my palette and have been using Winsor-Newton's Winsor Blue (Green Shade) along with Holbein's Burnt Umber for the final few dark accents. 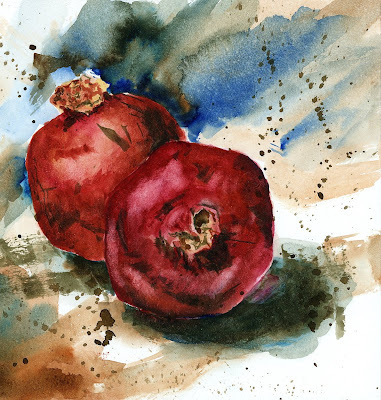 I like the Holbein Burnt Umber because it re-wets well; the Winsor-Newton brand of Burnt Umber tends to dry up and crack and then is lumpy to re-wet. Of course, the Winsor Blue Green Shade is terrific, but may be a little bit redundant. We'll see. The most fun discovery was when I dropped a bit of this mix into wet Cerulean -- it really moves around and gets interesting. There will be much more experimentation before the new colors finally go onto the palette, though -- so if any of you have any suggestions (pro or con) please let me know! 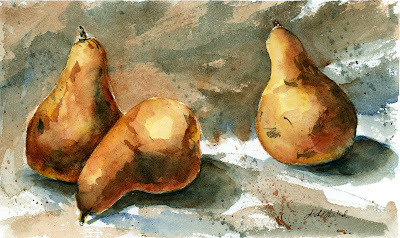 Well, the pomegranates at the store didn't look near as interesting as the one I've already cut up, so I decided to paint some pears I had lying around. One was kind of a mess and had to been thrown out afterwards, and another was a very nice snack. 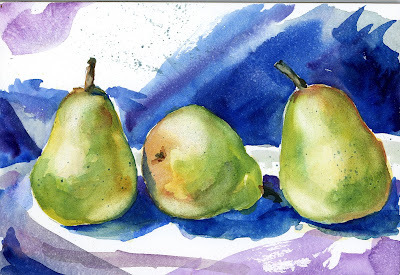 Pears are much harder to paint than I'd expected! The lump on the far right was bothering me, so I scrubbed it out. There. I feel better now. From this angle you can see how lumpy this fruit is! :-D Hmmm... shall I cut it open now and paint the insides? 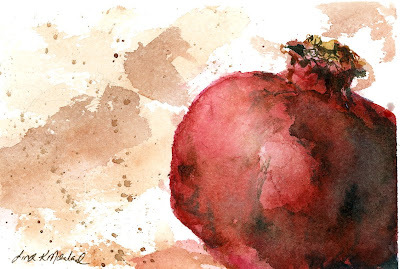 So ... how long do pomegranates last before they go bad? And how do you know they've gone bad? This one is starting to look a little bit leathery. I think I'll pick up another one tomorrow. 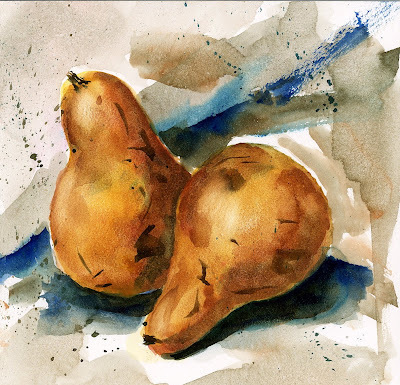 Okay -- so here's the BIG NEWS from watercolor class. 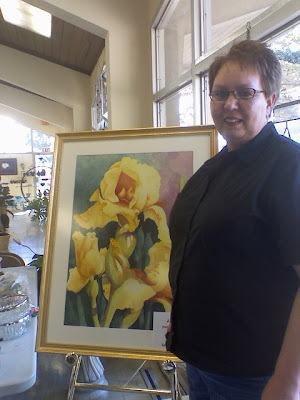 My girl Zelma, shown here, did that wonderful huge painting of irises you see behind her. Her painting very deservedly won the distinction of being chosen for the POSTER for the 2008 - 2009 Artapalooza fundraiser for the Fountain City Art Center. People, this painting absolutely ROCKS. And so does Zelma. Posters are available for $30 from the art center. When she told me she'd entered her piece I knew she'd win -- when she told me she'd won, I was as thrilled as if it was my own. Way to go, Zelma! ;-) Now, don't you guys think Zelma needs her own blog? I do! Let's take a vote! And, again -- Zelma's painting ROCKS, doesn't it! 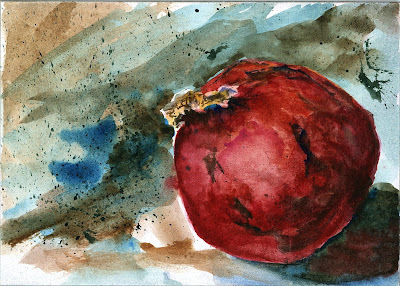 Pomegranates are very interesting fruit to paint. I struggled to find the right color and texture, but resisted the urge to finish off with colored pencil or ink. Fun stuff!